Technical Car Experts Answers everything you need: 1998 Ford F150 pickup Battery Drains overnight due to Alternator? Alternator drains car battery? There are many possibilities,that can cause this.But in this particular case,all other possibilities are ruled out by the client and its mentioned clearly that alternator issue is draining the car battery,after it sits overnight. So in this case best option is to directly replace the alternator and see if that is he;ping/.But instead of that,its advisable first to confirm the problem. This problem could be anything from a shorted diode plate to the voltage regulator or even a shorted field coil winding and in most cases rather then trying to replace each one of these which would most likely cost you just as much you would be much better served to go ahead and replace the alternator assembly. By doing so you would also gain the warranty. There is a 20 amp fuse in the wiring harness to the alternator (odd location) and pull that fuse and check,does the current drain at the battery terminal Stops or its the same. The 20 amp mini fuse is for the armature on the alternator , what happens if you unplug the LG/red wire from the alternator? LG means lite green that comes from the instrument cluster, unplug mes remove it and you would be best to do it at the cluster. If the draw goes away you likely have a bad cluster providing the new alternator is good. 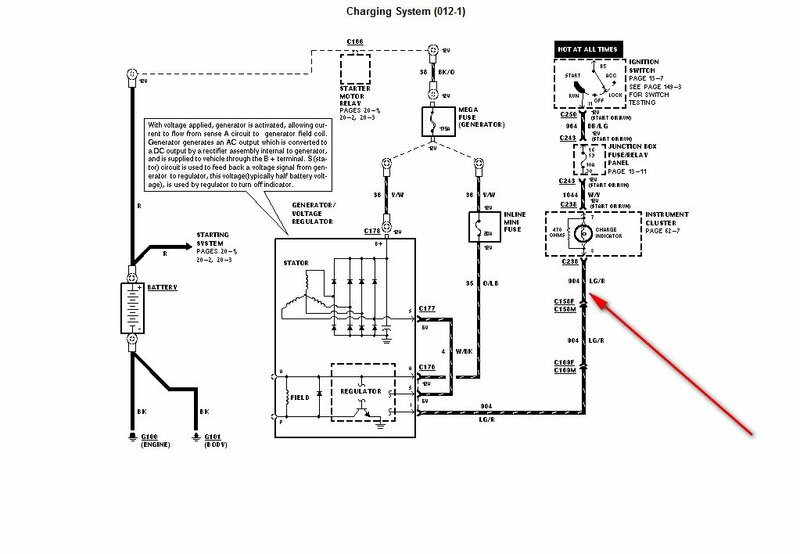 The light green/red wire is pointed out with red arrow in the diagram for better understanding.